Posted by DustinRJay in Calgary real estate, Uncategorized. As noted in previous posts, Calgary’s affordability has been on an improving trend. RBC economics shows that the current affordability in Calgary is nearing cyclical lows. If one looks at the period, all of the time between 1998 – 2005 I would consider fairly good times to buy. Since 2007, a combination of rising household income, falling house prices and lower interest rates have all improved the affordability of housing. It’s important that individual market participants come up with a budget before buying that includes maintenance costs, condo fees, taxes, water, gas, electricity, insurance and mortgage costs. One should also budget for a higher interest rate environment when renewing in 5 years and consider things like retirement planning as well, risks of losing a job, and the amount of disposal income one will have available after tax. I think the affordability metric is one indicator of the relative value of housing (particularly in Canada) as Canada has not had the same volumes of subprime lending. Studies have shown that regions within the US with higher amounts of subprime lending have fallen faster and harder than regions that don’t have the same amount of subprime lending (even if prices are relatively elevated in both cases). In regions with high amounts of subprime lending, I believe it is more important to pay attention to price to income instead of affordability. I think that affordability is a leading indicator for future mortgage arrears. When affordability becomes stretched, it’s likely that mortgage arrears will increase countercyclically over the following years. The Calgary real estate correction in 1982 was predicated on extremely poor levels of affordability as noted in a previous post. 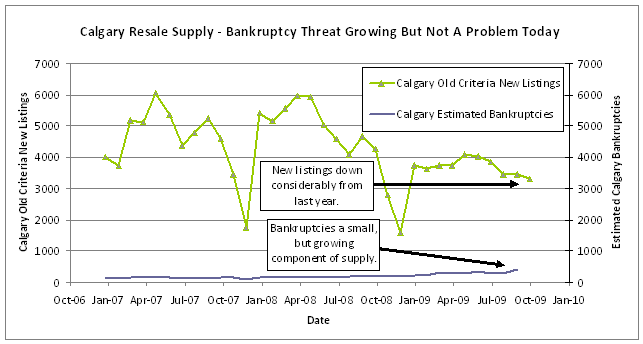 Posted by DustinRJay in Calgary real estate, CMHC. Studies have shown that there is a tendency among analysts to be consensus seeking. More often that not, analysts are benchmarked against their peers so an analyst may be rewarded even if his prediction is off the mark as long as it is not too far off from consensus. According to some studies, analysts are more likely to be optimistic when revising downwards, and pessimistic when revising upwards. Although limited data is available, I believe CMHC is prone to some bias tendencies. 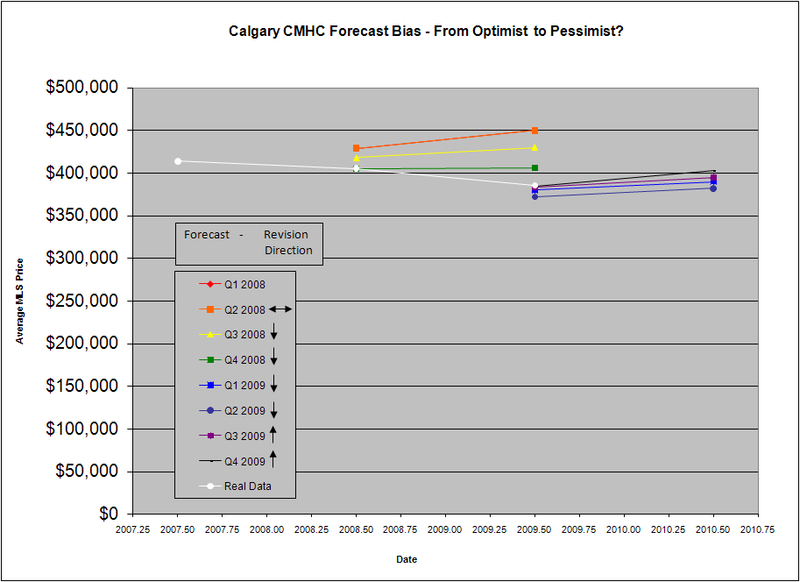 CMHC always forecast price increases for the following year since they have been putting out forecasts in Calgary since Q1 2008. This illustrates they may have an upward bias to forecasting prices. In addition, during the correction period in 2007 and 2008, there were four consecutive downward revisions. The probability of four consecutive downward revisions is 1 in 16. While the economy and oil prices did deteriorate considerably over this same period, I believe that the consecutiveness of the revisions may reveal a bias in CMHC forecasting towards being overly optimistic when revising downwards, with the potential of being pessimistic when revising upwards. For these reasons, I believe that the BEST information available from CMHC may not be only the price that they are forecasting for the next year, but also information in which revisions are being made counter to previous trends. CMHC has broken with the previously held consensus revision trends as of Q3 2009 and that may be newsworthy in itself.